Everybody thinks about the Middle Ages like about the time of tortures and fire. And that’s a pretty correct insight for a historical period when people got burned at the stake just because they were beautiful (thus, practiced witchcraft – obvious, isn’t it?) or believed in science more than in God. Michael Servetus was the first scientist from Europe to describe correctly the blood circulation between the lungs and heart. Can you guess how he was rewarded for that? Right – the church called him a heretic and burned him with a “purifying” fire. And what about Giordano Bruno who supported the theory that the Earth was not the center of the universe? Did the church spare his life? Nope, after 7 years in prison, the Pope decided that it was time to burn the heretic. Quite a period to make discoveries, isn’t it? But you live in a completely different world where sciences are being respected and developed, and the access to information is (almost) limitless. 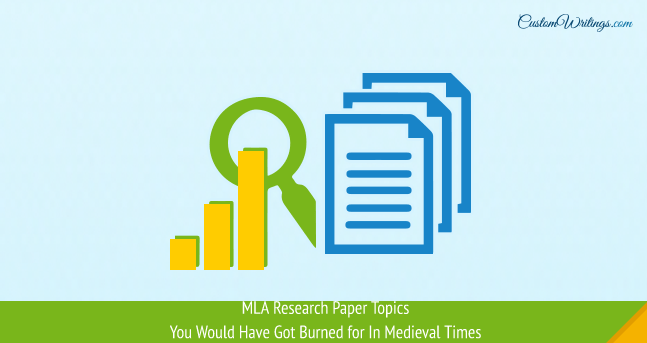 So, let’s have a look at 20 MLA research paper topics that you can easily explore today, but could have been burned for in the Middle Ages. Did Humans emerge to Eat Meat and Drink Milk? No matter how interesting the topics sound to you, you would have been punished if you had chosen to explore them in the medieval times. Though, if you had confessed your sings, the prosecutors would be more merciful and strangle you before burning. Sorry for the awful details, but that’s the cruel reality, so cheer up! Now you can study whatever you want without any consequences.